phpMyAdmin is a program used to manipulate databases remotely through a web interface. At the basic level, it allows you to fully manage database tables(create, edit, drop (delete)) and data contained in them (select, update, delete rows). phpMyAdmin also allows you to create and restore database backups. In this tutorial, we will cover database restoration process only. The following instructions will replace your current database with the backup and revert your database to the state it was in when you backed up. phpMyAdmin is usually located in the Databases section on the control panel. In the left navigation tree click the database you want to import the backup into. You will then see either a list of tables already inside that database or a screen that says no tables exist. This depends on your setup. Across the top of the screen will be a row of tabs. Click the Import tab. On the next screen will be a button named Choose File or Browse, click it. In the dialog, locate the database backup file stored on your computer and click Open. You should see your chosen file name shown next to the Choose File button. Make sure SQL is selected in the Format drop-down menu. If you get an error message instead, you can always ask your hosting provider’s support for assistance. Having finished this tutorial you should have already successfully restored your database from a backup file using phpMyAdmin. With this knowledge you should be able to successfully restore any MySQL database, so don’t forget to make backups occasionally. I Have deleted my MYSQL database from my hostinger account unexpectedly.The problem is i dont have the backup of that database..but i have the database name and path of the database.can you please help me.It’s very urgent for me.please help me as soon as you have seen this message. 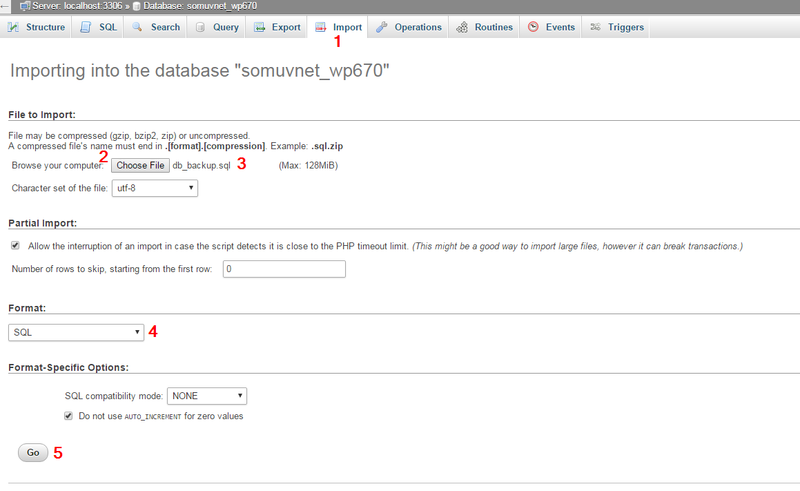 Actually the thing is Mywordpress data is linked to that database.i want it back..please help me. I try to import a base from Go-Daddy. As I understand, you can not create a database with the same username as GoDaddy, and because of that, I get error messages. Yes, you will not be able to create a database with the same name. However, you can edit your PHP scripts and use new db and username there.